Background– Recently my wife was out of town long enough for me to have to take sole responsibility for the accumulated laundry. My normal (apparently male) predilection is to just dump all the clothes in together since we run a cold water wash cycle. I had done this plenty of times before and nothing particularly bad (or pink) had come of it yet. Inspiration – At the last moment it occurred to me that this was an opportunity to run an experiment. What if I suppressed my natural urges and separated the lights and the darks and washed them separately? 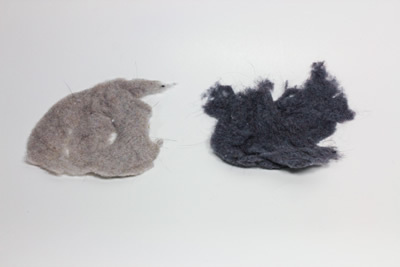 Would I see a difference in the lint captured on the dryer filter? And by 'difference' I of course mean 'fluorescence difference'. So I ran the two loads and explored the resulting specimens under white light, excitation by longwave ultraviolet light (predominantly 365nm), and excitation by blue light (~440-460nm). 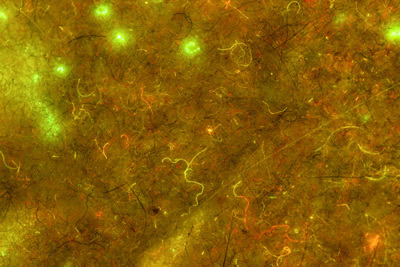 Startling results – It was no surprise that there was fluorescence. Laundry detergents commonly include fluorescent brighteners to make 'whiter whites, brighter brights'. These are designed to absorb ultraviolet light and emit in the blue portion of the spectrum. 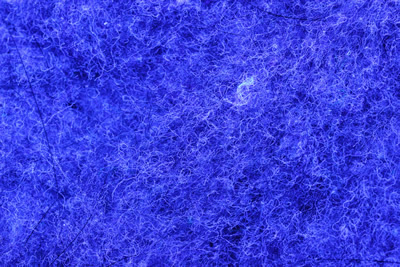 Anyone who has been in place using black lights had probably noticed fibers fluorescing blue-white. 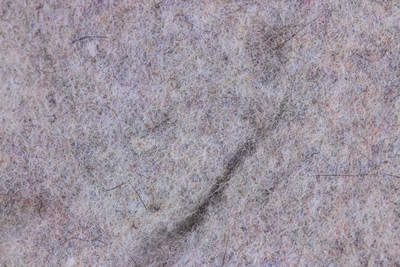 And what is dryer lint but a large collection of these fibers. So it should come as no surprise that I found a blue-white fluorescence under UV light. 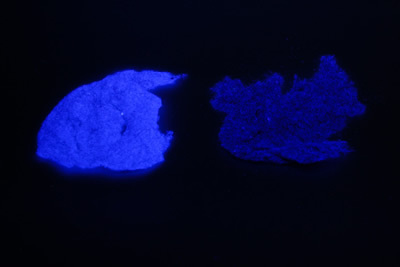 But what was really striking was the difference in fluorescence between the dark and light lint under UV and blue light excitation. It is almost hard to believe that they are images of the same sample. 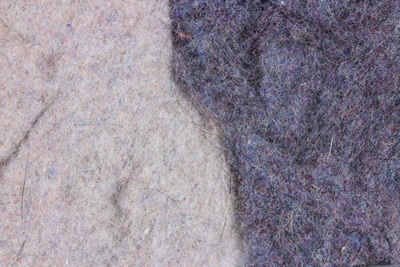 The first set of images below shows the collected lint as a whole, against awhite posterboard background. 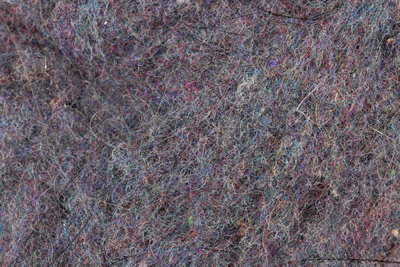 As you can see in the white-light image below, the load of light-colored clothes produced light lint while the load of darks produced dark lint. (Anyone from the Nobel committee paying attention?) 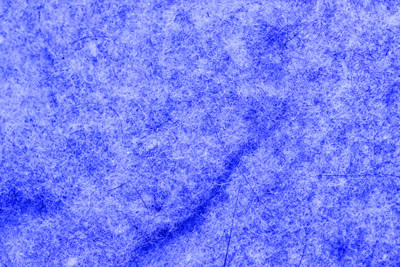 Under ultraviolet excitation both fluoresced blue-white, and the light lint fluoresced much more intensely than the dark. 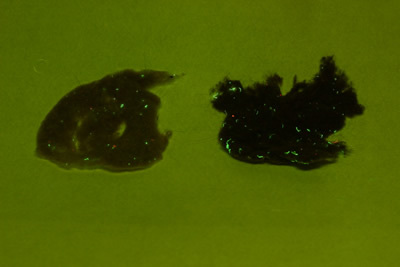 With blue light excitation the bulk of the dark lint seemed to not produce much fluorescence, while there was a weak general fluorescence from the light lint. 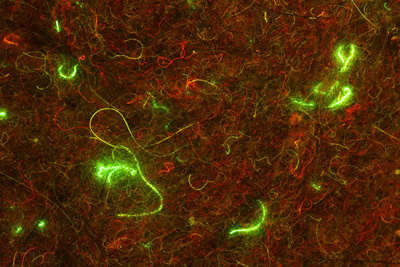 In both the light and the dark there were some very strongly fluorescent fibers mixed in. 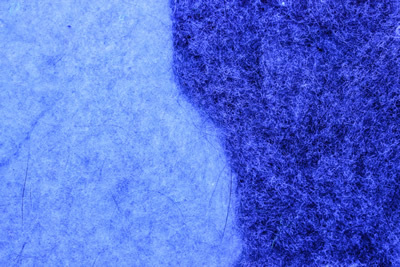 The next set of images shows the light and dark lint right next to each other, again under white, ultraviolet, and blue light. Now the light load lint in detail, and then the dark. 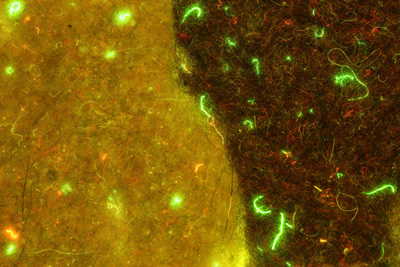 So even humble dryer lint can produce beautiful and informative fluorescence. This is further evidence that fluorescence is all around us, and that different excitation wavelengths can produce radically different responses. The results could have specific implicationsfor fields such as forensic sciences, but the lesson is general – what you see depends very much on how you look. Stay tuned for future explorations!